Description: This collection contains 10 grade 1-2 solos for instrumental solo with piano accompaniment. Each solo book also contains a CD recording with 2 tracks per piece - one with soloist and piano accompaniment, and one with piano accompaniment only. 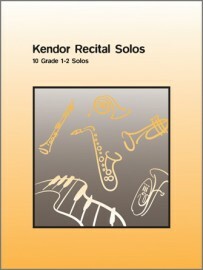 Many of the titles have been published as single pieces and are listed on several state contest lists. Piano accompaniment book sold separately (#10332). Available in SmartMusic.